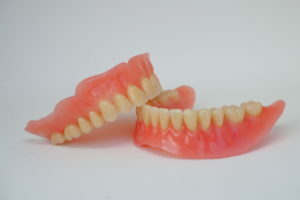 A traditional full set of dentures has a large acrylic base that holds the false teeth. This base simply rests on the gums and jawbone remaining in the mouth after all of the teeth have been extracted. The gum and jawbone remaining after the teeth are pulled are called the alveolar ridge. The upper and lower jawbones are unique in that their only purpose is to support teeth. Once teeth are removed, the bone shrinks and recedes because it no longer has anything to hold onto. This process happens slowly over a period of years. 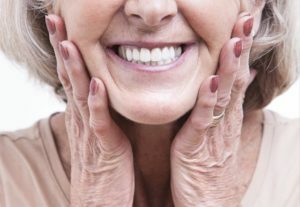 As the ridge shrinks, there is less and less for the denture to sit on, so dentures become increasingly loose and difficult to wear. Some people are able to adapt to full dentures and use the muscles in their cheeks, lips and tongue to hold them in place while eating and talking. However, many people are not able to achieve that level of muscle control and struggle to keep their dentures in place, often suffering difficulty chewing, and embarrassment when talking or laughing. At Designer Smiles, Dr. Ann and Dr. Lauren place dental implants, which are used to support dentures, using the same three-dimensional technology used for a single-tooth replacement implant. It begins with 3D imaging for preoperative planning. The images are used to prescribe the exact location for the implants. Then a surgical guide can be made from these digital images so that your dentist can translate the prescribed location of each implant into reality during surgical placement. This preoperative planning gives the most predictable, successful long-term results for both the implants themselves and the denture they will support. Once the surgical phase is complete, and the implants have achieved adequate stability to withstand chewing forces, Dr. Ann and Dr. Lauren will fabricate dentures with appropriate attachments to connect securely with your implants. 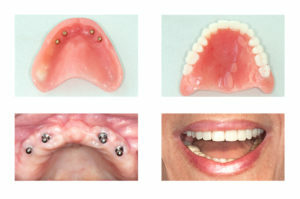 With implant-supported dentures, any adjustment period is much shorter due to the security and stability of the implant-denture connection. This creates a level of function far superior to any achieved by traditional dentures. Patients are more comfortable and more confident with implant-supported dentures. If you are interested in implant-supported dentures, call our office at 281-667-4010 to set up a consultation with Dr. Ann and Dr. Lauren.